Ok, so that's pretty straightforward , so why blend? There's a few reasons behind that but the most common one is to add complexity to the wine, whether that's complexity of flavour or texture, essentially to add something into the wine that it doesn't already have to make it better. There's a practical reason for blending too, in locations that suffer from high disease pressure (like Bordeaux, the home of blends) it's a good idea not to rely completely on one varietal as if you don't get the grapes you need, well, you're stuffed! As a blend doesn't have to be uniform every year you can make the better crop, the dominant grape that year. Makes sense, hey? Red blends are relatively common so I thought I would focus on white blends this week, because, well because why not. Also two of these blend are aromatics & I we all know how super passionate I am about getting more people drinking amazing New Zealand aromatics. From the team at Elephant Hill in Hawkes Bay comes Le Phant Blanc 2015, this blend is Pinot Gris (45%) Viognier (30%), Chardonnay (20%) and Gewurztraminer (5%). Hawkes Bay is one of those areas that can have high disease pressure so this blend changes every year with the 2016 being Viognier dominant. This wine has lots of delicious stone fruit and apple flavours yet a creamy texture and dry with 1.3 grams of residual sugar - yum! $22 and available at good liquor stores nationwide and enjoy with Thai or Indian food but be mindful of the fact that this is a 14% wine & let's not forget our standards! 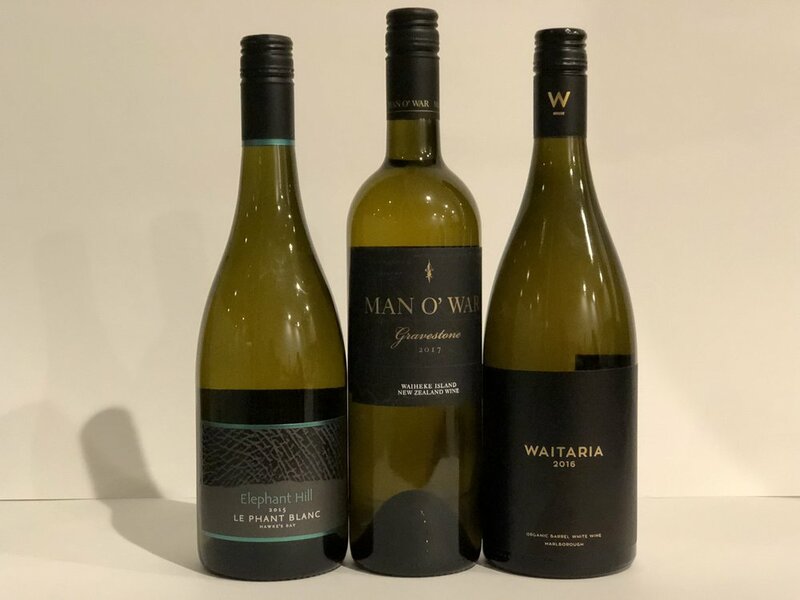 Iconic Waiheke winery Man O War rarely fails to deliver and their “Gravestone” Sauvignon Semillon 2017 is pretty spectacular. 85% Sauvignon Blanc & 15% Sémillon this wine is named after the basalt boulders that surround the vineyards and is fermented together for three months marry the flavours before bottling. This wine is dry with flavours of gooseberry and lychee and is available from bottlestores for $28 - a good NZ expression of a Bordeaux White. Enjoy with seafood or shellfish like salmon, scallops or prawns. Last but definitely not least is Misty Cove's "Waitaria" 2016, this blend of Sauvignon Blanc, Pinot Gris & Chardonnay from Marlborough is both Organic and limited edition. These are the people who brought us wine in a can, but just because they are innovating in that space, doesn't mean that they are not serious wine makers and this is a seriously good wine. Once blended the wine is matured in oak for a year before release which gives this wine even more complexity & additional flavours of vanilla that we associate with oak aging on top of the peach & melon oozing from this multidimensional, bone dry wine. Enjoy with pretty much anything but I would most likely eat with an all the trimmings roast chicken. A real treat! Click the link below to hear my chat with Wendyl on the Long Lunch on RadioLIVE today about these beautiful white blends.